The Aboriginal conference is open to all financial Aboriginal and/or Torres Strait Islander members of Federation. There will be keynote speakers, stallholders, workshops and more. Catering is provided throughout both days of the Conference. 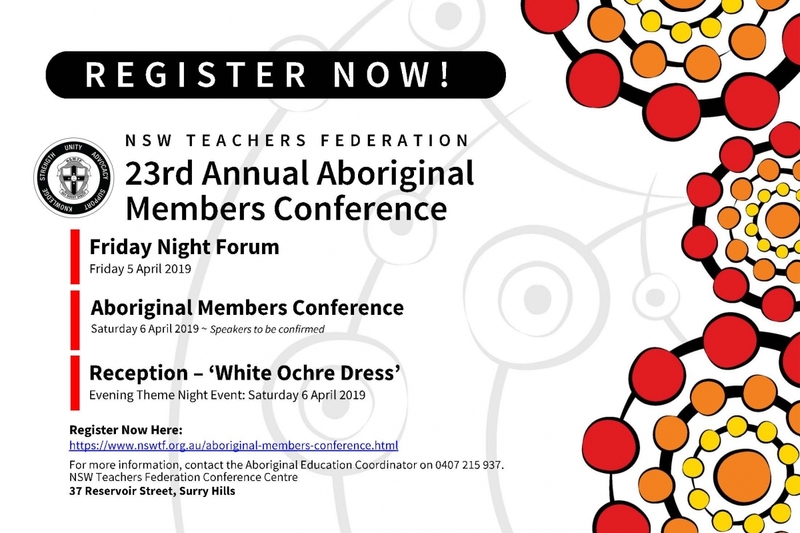 All Financial Aboriginal and Torres Strait Islander members of the NSW Teachers Federation can attend. Student members are more than welcome to apply, but are reminded that the Federation cannot cover costs relating to Travel and Accommodation unless they are a paying (Financial) member of the Federation. Registrations close Friday 22 March 2019. All registrations, Travel Forms & RSVP’s must be returned by this date. If you cannot return your paperwork by this date, please notify us at nswtfae@nswtf.org.au at your earliest convenience. The theme for this year’s Post Conference Event is “White Ochre”. Please come in your best white outfit, white ochre and join us for a night of culture, networking and catching up with the mob! There will be a break between the end of Conference and the beginning of the evening event, so there will be plenty of time to freshen up in between. If you need more information on the theme night, please contact us at nswtfae@nswtf.org.au or 02 9217 2172.